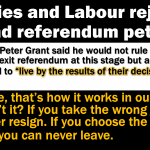 If you take the wrong job, you can resign. If you choose the wrong partner, you can leave. If you go on the wrong journey, you can turn back. In our personal lives, second thoughts are allowed. Thinking again, with the benefit of more information, knowledge and experience, often provides a superior result. 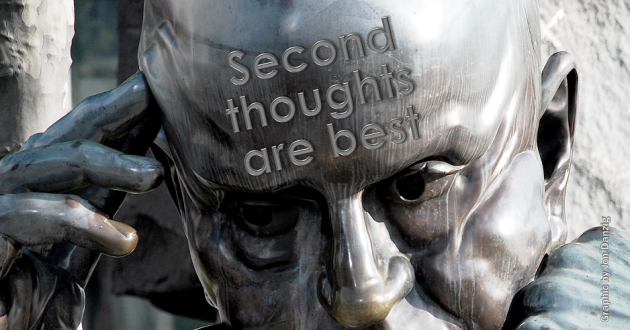 As the saying goes, ‘Second thoughts are best’.Why should it be any different in politics? Britain desperately needs a chance to have second thoughts about Brexit. 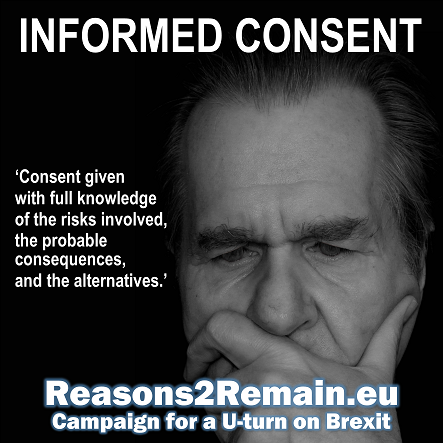 After all, nobody gave an informed decision for the UK to leave the EU in the referendum, because we were not adequately informed. 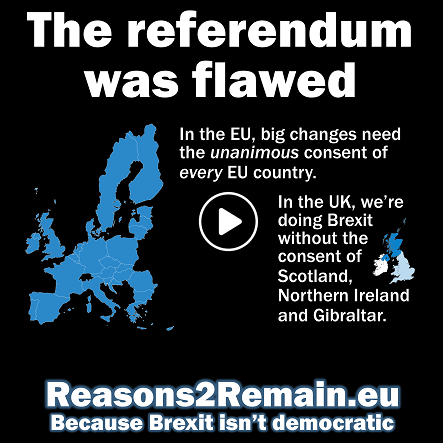 On the contrary, the country was misinformed, in a referendum that was profoundly flawed. The Leave campaign had to rely entirely on lies, mistruths and false promises to win the referendum. Furthermore, their win was only by the tiniest of margins. 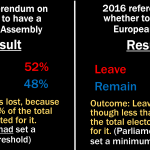 And only a minority of registered voters voted for Leave – just 37% of the electorate. That proportion would not even be sufficient to change the constitution of the Conservative Party, or UKIP. Nobody knew in the referendum what Brexit meant, and we still don’t know. Except that we now know just how painful Brexit will be for Britain. 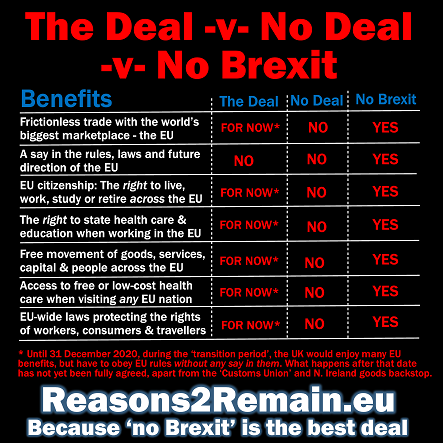 With higher food prices (they are higher already); the loss of a say in the running of our continent; the loss of free movement for Britons across our continent, as well as the loss of free movement for our European neighbours coming here. Not to mention key industries leaving us, our economy suffering, and years, probably decades, of disruption ahead. All to get back our country that we never lost; all to gain sovereignty that we always had; and all to reduce migration when we’ll still need just as many migrants as before to do all the jobs we simply don’t have enough Britons to do. With the benefit of hindsight, many people in Britain can now see and understand that the Brexit decision was wrong. How often in our own personal lives have we wished we could have reversed a decision with the benefit of hindsight, but alas, it was too late? But the thing about Brexit is that it isn’t too late. We have not yet left the EU. 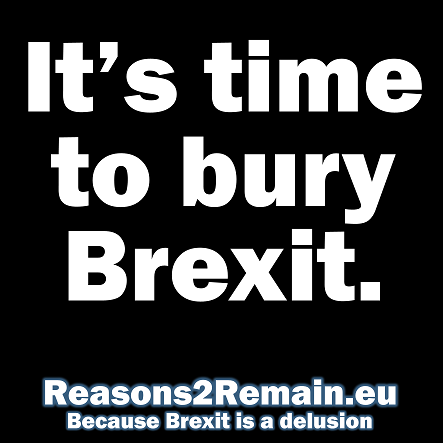 Britain can #StopBrexit, if that’s what Britain wants. Increasingly, polls indicate that’s exactly what most Britons now want. A U-turn on Brexit. Across the country, voters are having second thoughts about Brexit, and it’s time our politicians took notice. 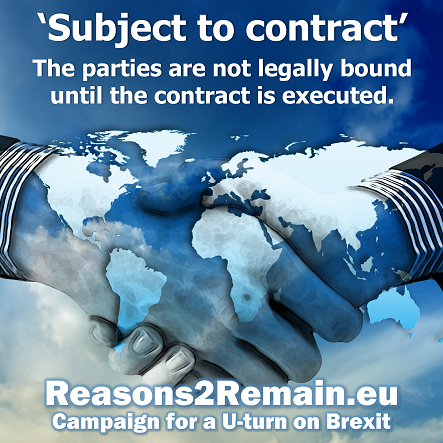 This entry was posted in Current Affairs, Democracy & Citizenship, Economics & Trade, Politics & Public Policy, The EU and tagged brexit, EU referendum, European Union, second referendum. Bookmark the permalink.